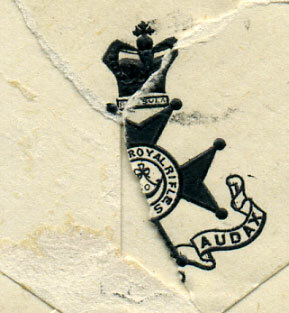 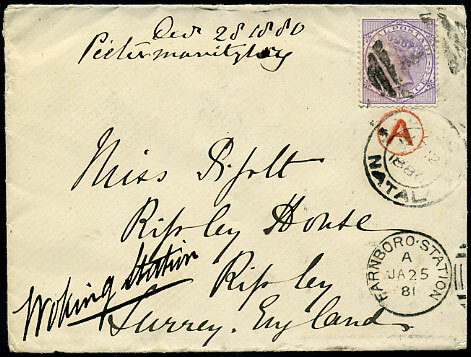 1880 cover with part damaged flap showing part "ROYAL RIFLES" printed crest with QV 6d pmk'd "1" numeral with 27 12 1880 despatch to Ripley House, Ripley, Surrey with handstruck red circled "A" (railway marking) with Farnborough Station A/JA 25 81 and on reverse Woking Station E/JA 25 81 cds. 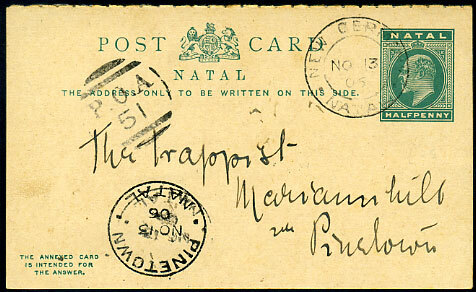 1909 col. ppc of Queens Bridge Hotel, Umgeni to Newcastle, Natal with KE7 ½d tied KOBENI OC 11 1909 skeleton with Vryheid transit alongside. 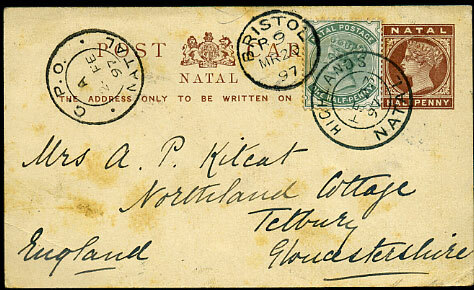 pmk'd FE 23 97 on QV ½d Post Card with added QV ½d to A Kitcat in Tetbury, Gloucestershire, toning. 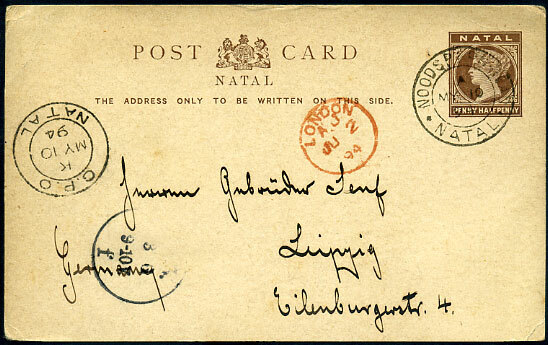 on KE7 ½d Reply Post Card portion pmk'd NO 13 06 to Pinetown. 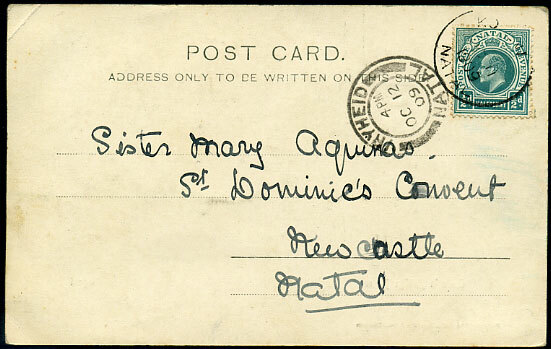 pmk'd DE 4 96 on QV ½d Post Card to Port Shepstone. 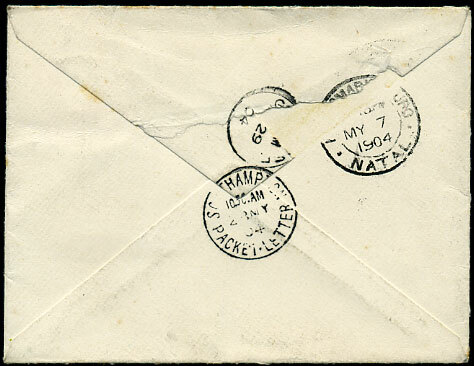 pmk'd 3 7 97 on QV ½d Newswrapper to Bern, Switzerland. 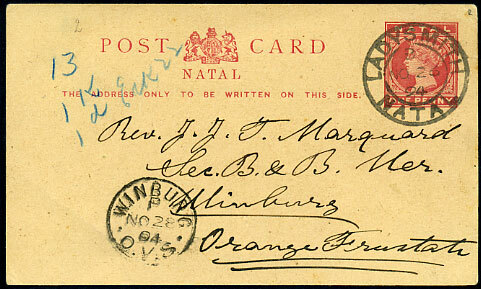 pmk'd B/NO 26 94 on QV 1d Post Card to Winburg, Orange Free State. 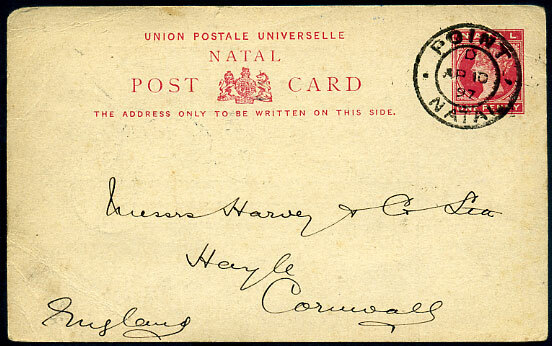 pmk'd D/AP 10 97 on QV 1d Post Card to Hayle, Cornwall. 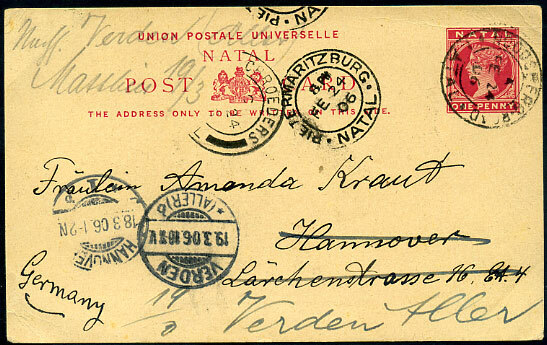 pmk'd FE 24 06 on QV 1d Post Card to Hanover, Germany locally re-addressed Verden. 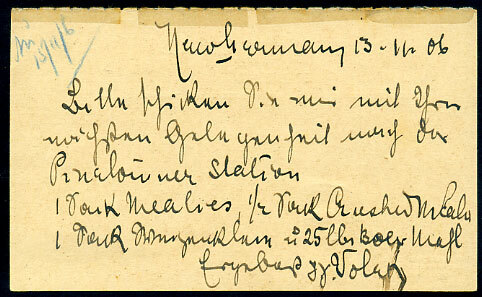 pmk'd A/MY 10 94 on QV 1½d Post Card to Leipzig, Germany. 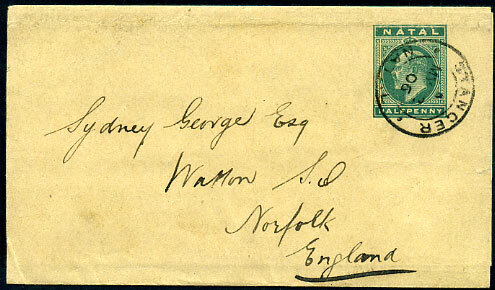 pmk'd A/MY 2 06 on complete KE7 ½d Newswrapper to Norfolk, England. 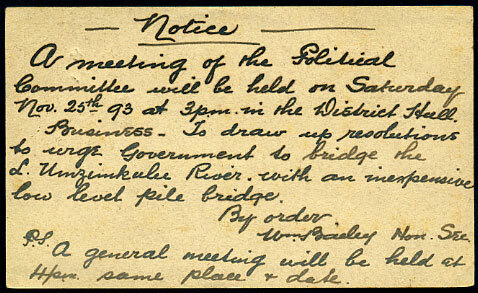 pmk'd B/NO 21 93 on QV ½d Post Card to Baboon Spruit, reverse meeting to urge Government to bridge the Lower Umzimkulu River with an inexpensive low lwvel pile bridge. 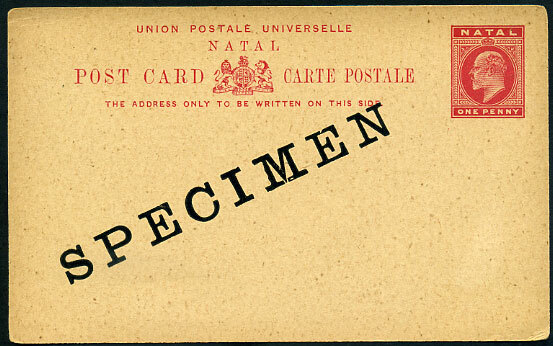 KE7 1d Post Card ovp'd "SPECIMEN", fine condition. 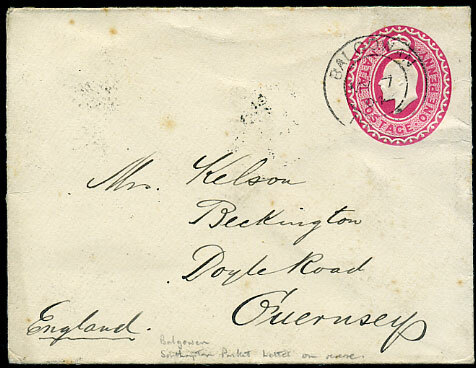 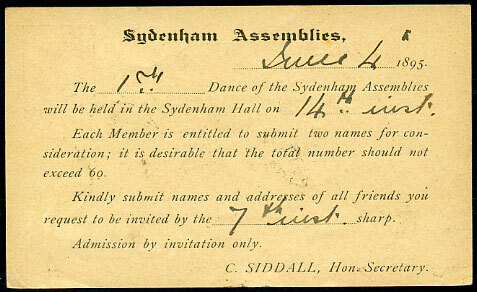 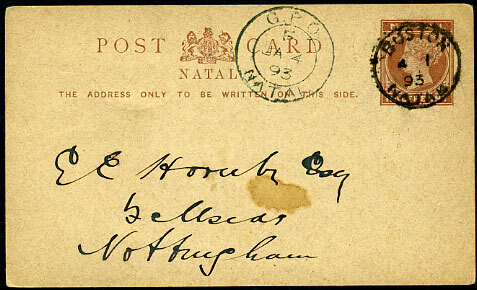 dated 4 1 93 on QV ½d Post Card to Nottingham, reverse with NOTTINGHAM ROAD d/ring and NOTTINGHAM cds dated 6 JA 93. 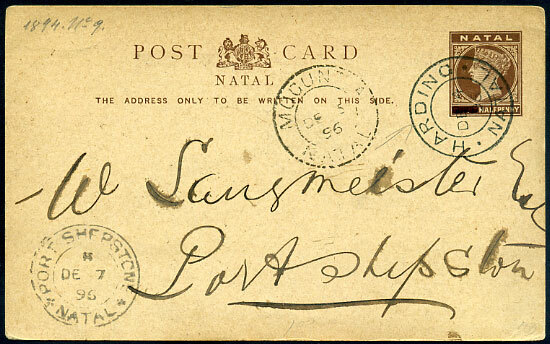 1895 QV ½d Post Card pmk'd "2" with DURBAN E/JU 5 95 addressed SYDENHAM with 5 6 95 arrival and re-addressed MUSGRAVE ROAD with 6 6 95 arrival. 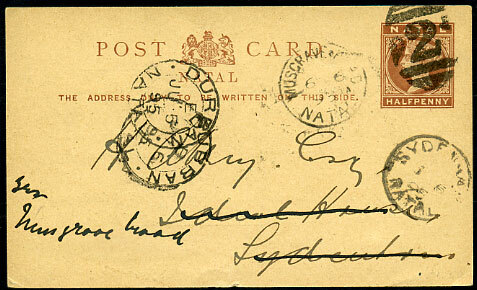 1904 KE7 1d PSE pmk'd MY 7 04 to Guernsey, partial flap damage. 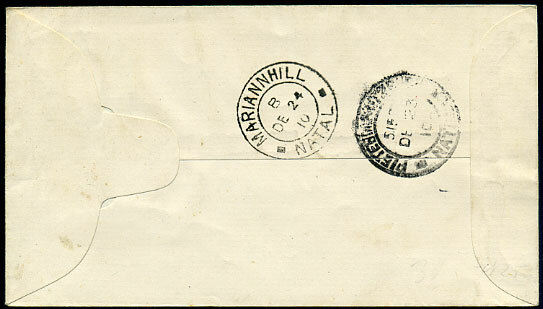 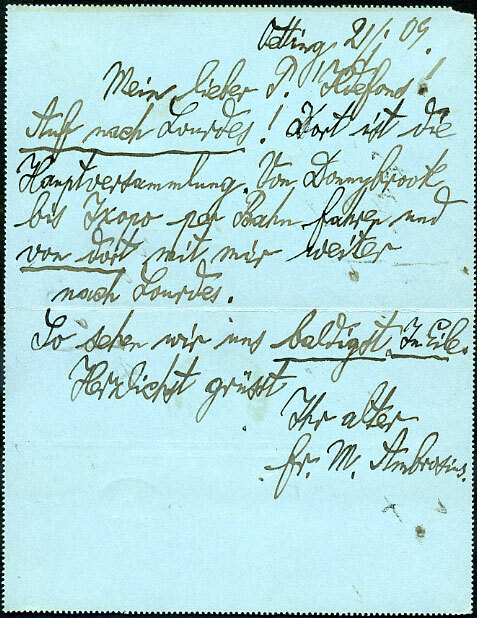 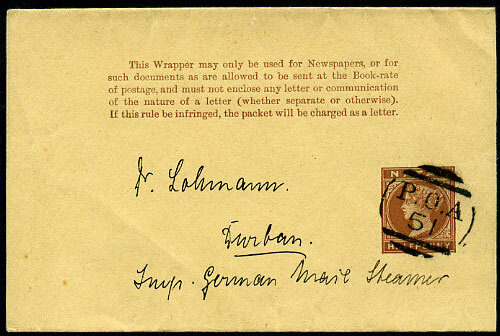 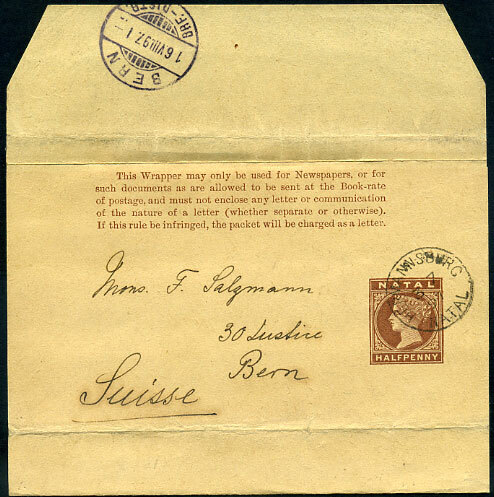 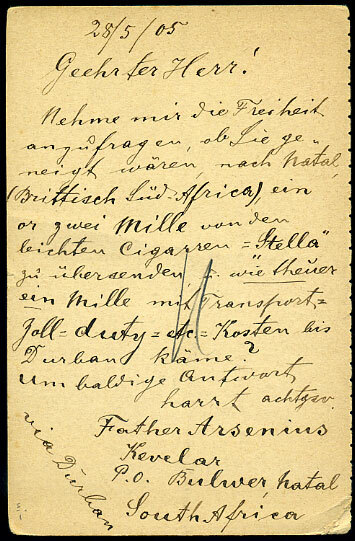 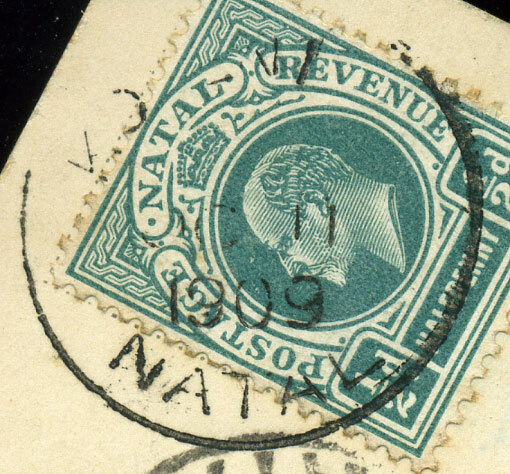 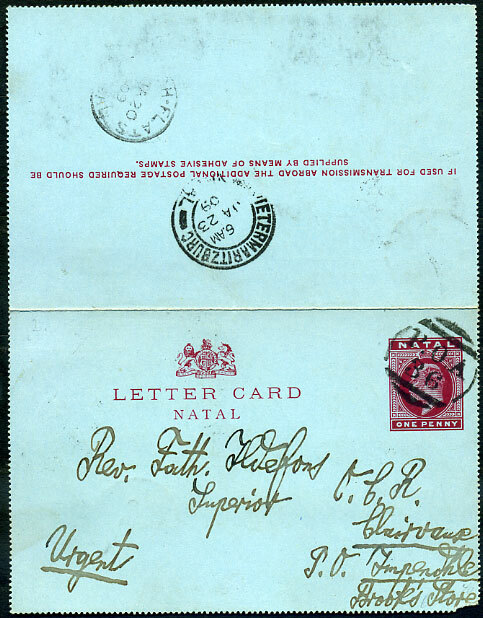 on undated complete QV ½d newswrapper by German Mail Steamer to Durban, no backstamps. 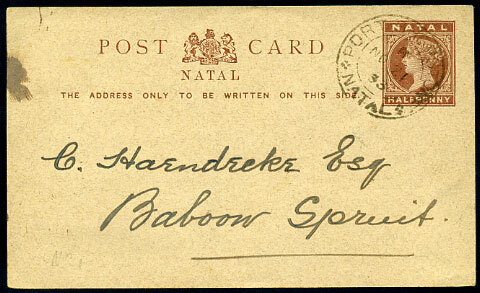 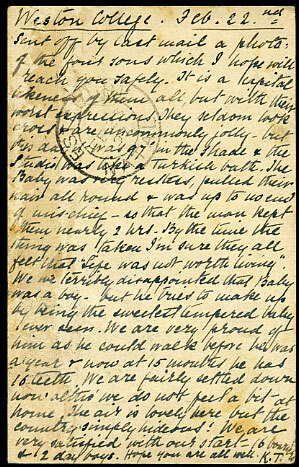 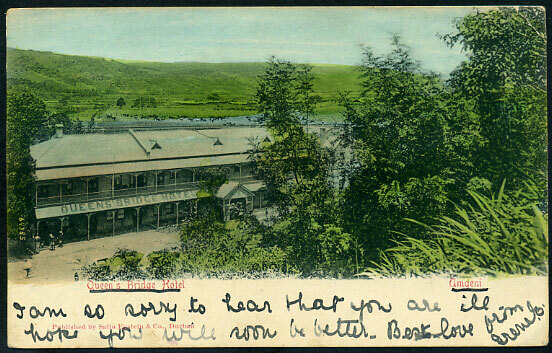 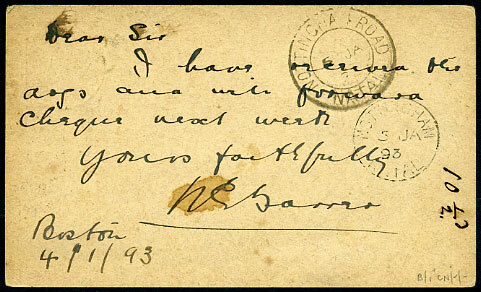 1909 KE7 1d LETTER CARD written 21/1 09 pmk'd P.O.A.36 to Brook'S Store, Impendhle. 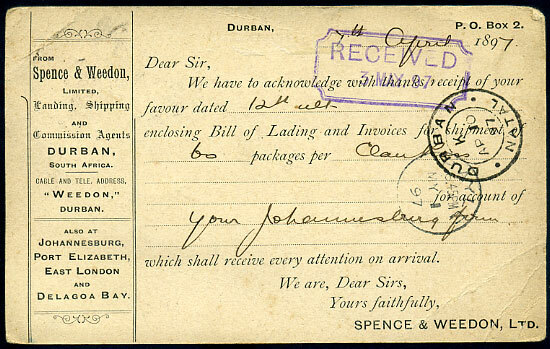 C/DE 22 10 on KE7 ½d PSE to Pinetown. 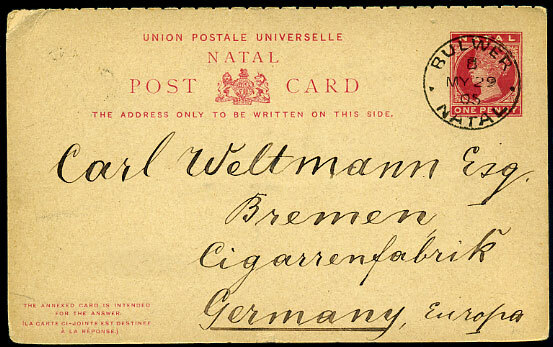 QV 1d UPU Reply Post Card pmk'd B/MY 29 05 to Bremen, Germany.